As promised in my last post, here are the photo's of my Halloween costume this year. Yesterday I attended a Halloween gathering with my family and friends and debuted my costume. I usually tell everyone what I'm dressing up as, but this year I wanted to keep it a secret and for the first time I actually succeeded. Ha! For lack of a better name, I'm calling this outfit "Portrait of a Lady". I'm not sure if I'm unintentionally plagiarizing something famous, or if I actually came up with an original title, but that's what kept coming to mind when I was wearing it and it seemed like an appropriate title. Photo's courtesy of my sister, Sereina. 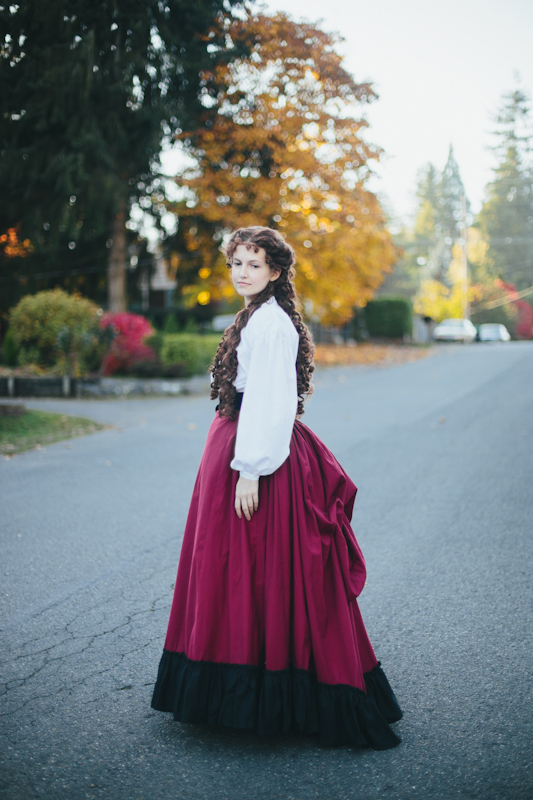 Skirt - this is the skirt from my 1871 dress I made last year, but with the train bustled. 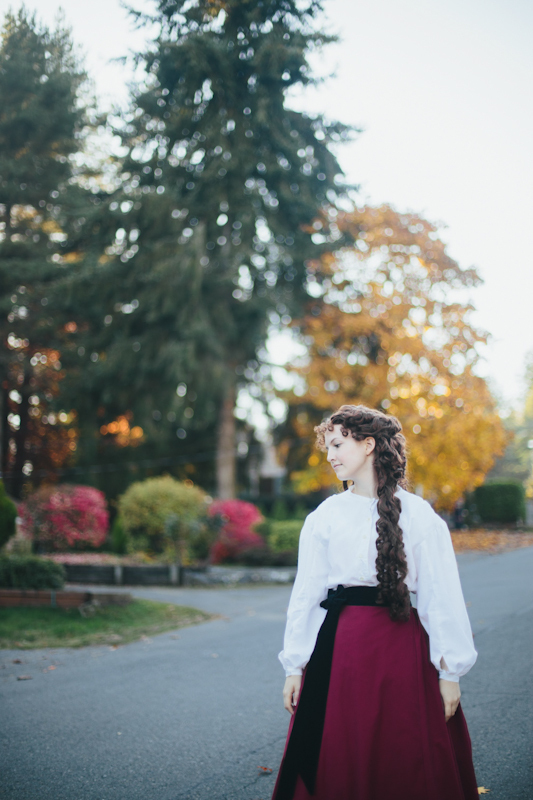 Blouse - cotton shirtwaist drafted by myself with a pattern from Period Costume for the Stage and Screen as a reference. Sash - self drafted and made from an upholstery velvet. Wig - heavily modified wig from Arda Wigs. 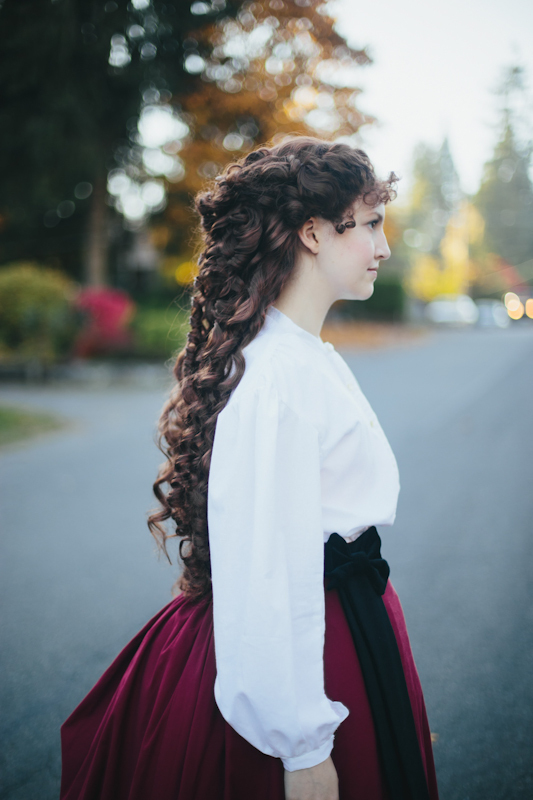 This is my Christine Daae wig I made several years ago and I'm so glad I finally got to wear it after putting so many hours into it! This is actually a dream costume of mine. I've always loved the 1860's shirtwaists and how informal and casual it looked. 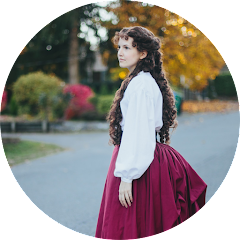 The dress the skirt was original made for was less than perfect, and at one point I almost threw it out all together, but then I came up with the idea of bustling the skirt and wearing it with a shirtwaist. I had attempted drafting a blouse several times before but it wasn't until now that I was actually able to figure it out. I'd still like to go back and make a nicer blouse and add more details to it, but I love the way this looks. With Halloween only a few days away, it's time to pull out the costumes. Halloween is one of my favorite holidays because it's an excuse to dress up, and eat way too much candy (but don't tell anyone I said that). Each year I usually try to make a special costume for Halloween, but this year I didn't have the time to start on anything early enough and I wasn't sure what I really wanted to do. 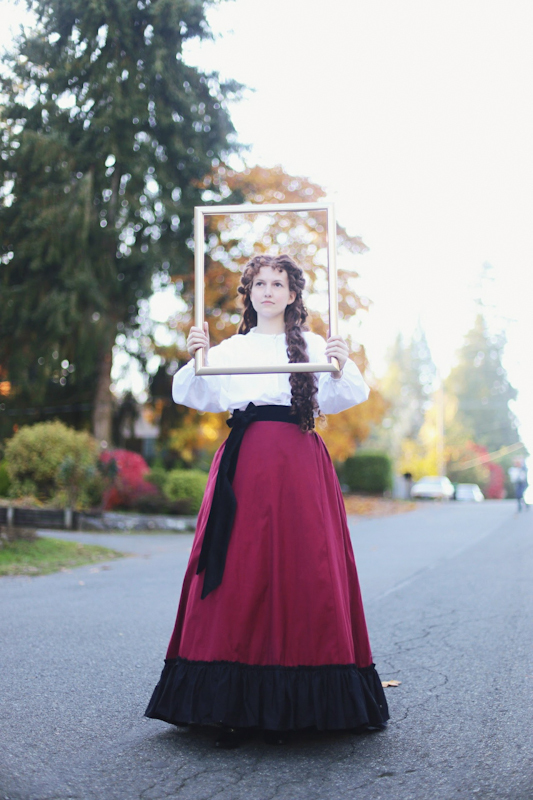 I started thinking up costume idea's that would fit with some of my historical clothing that I hadn't worn yet or very often, because I love wearing period clothing and will come up with any excuse to wear it. 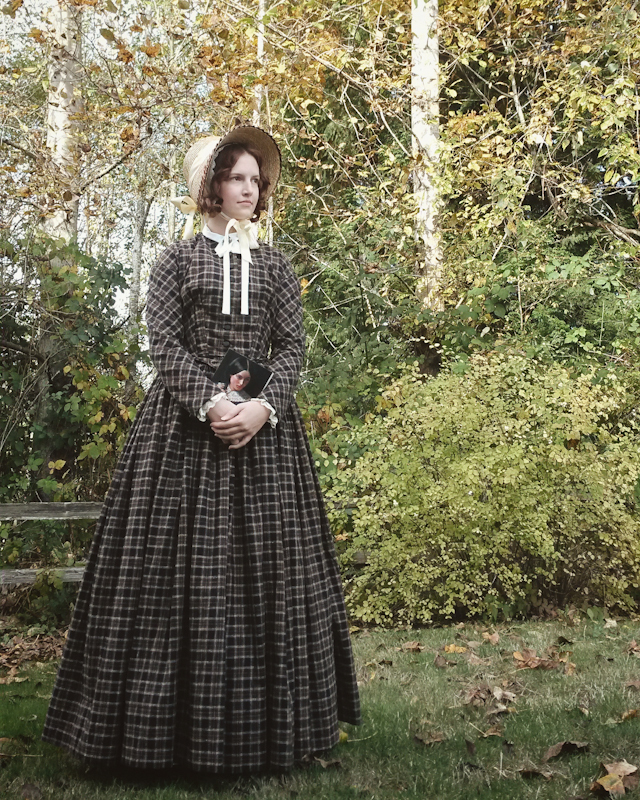 I came up with a few idea's that aren't too specific and can work with a variety of period clothing, which I thought I'd share in case someone out there needs some inspiration. 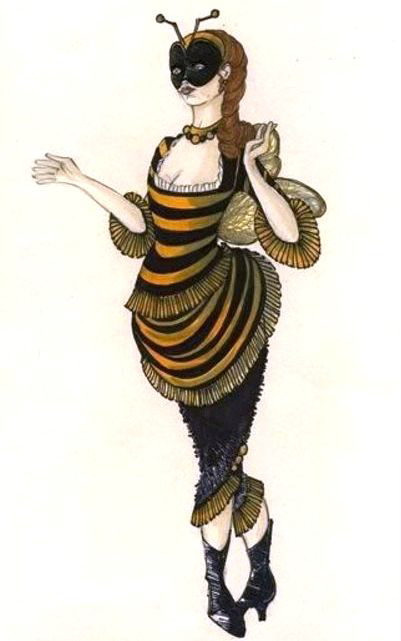 Then of course, there's always Victorian "Fancy Dress" costumes, if you have the time to put into it. 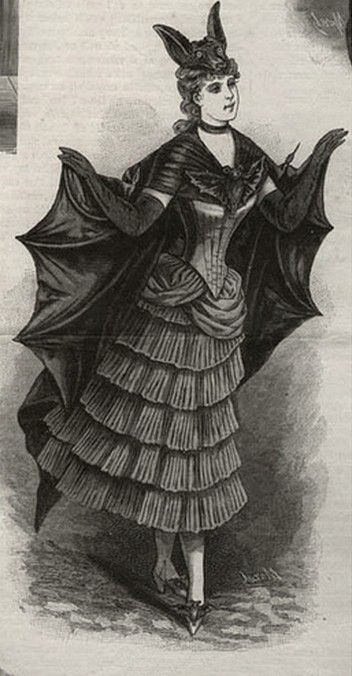 I love seeing Victorian costumes because they're so unique and usually quite silly. 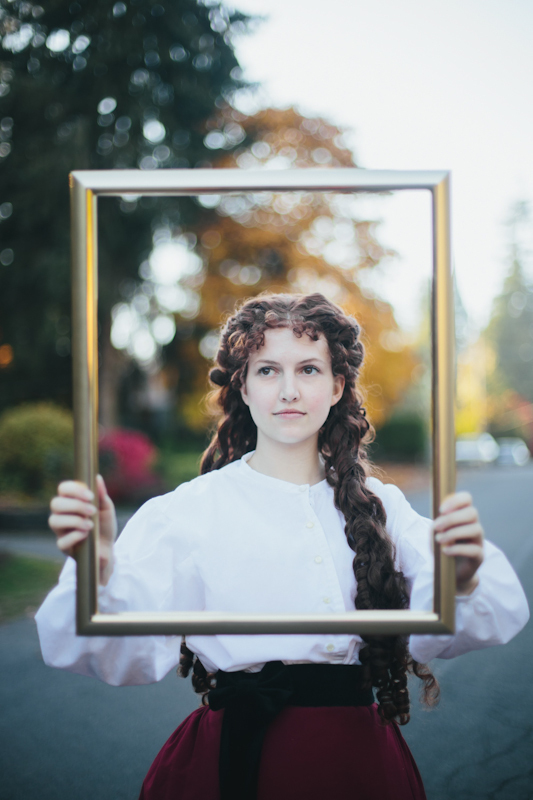 I'll be sharing my own historical Halloween costume in my Monday post, but for now I have to keep it a secret until after I wear it at a party on Sunday. 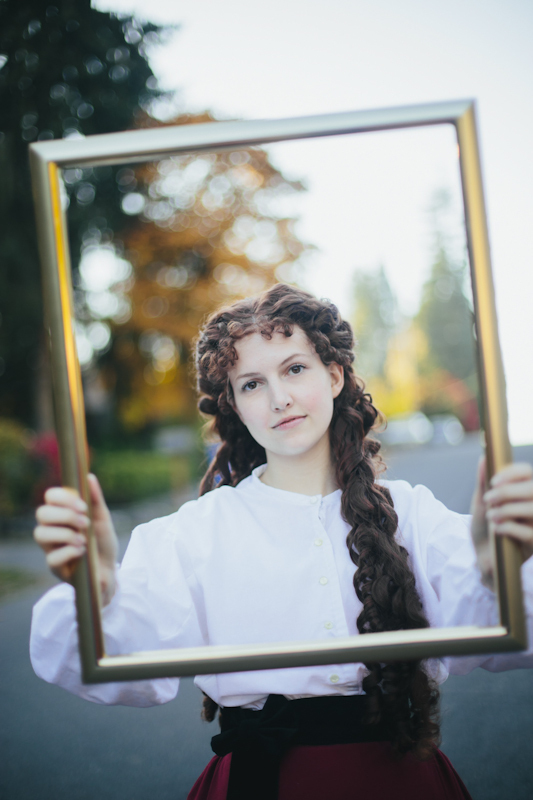 What are you dressing up as for Halloween? 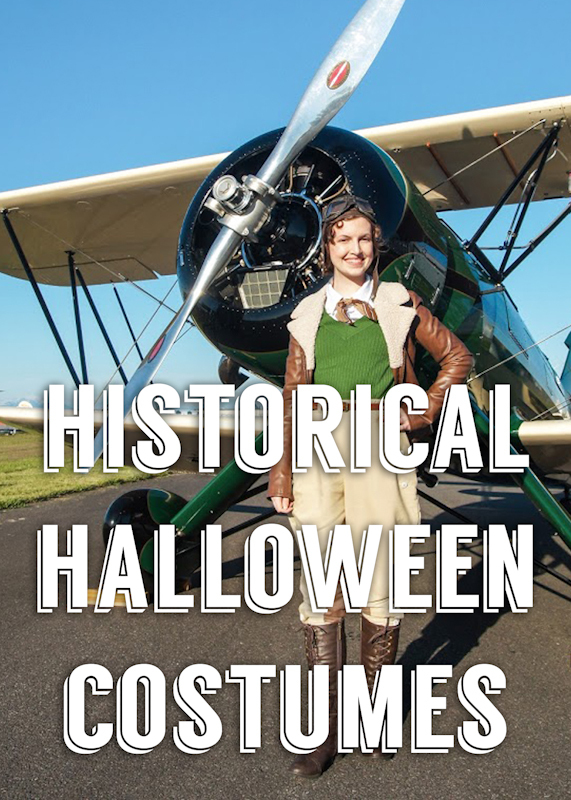 Do you like to wear historical costumes for Halloween? Let me know in the comments! I've been in a bit a of a sewing rut lately. 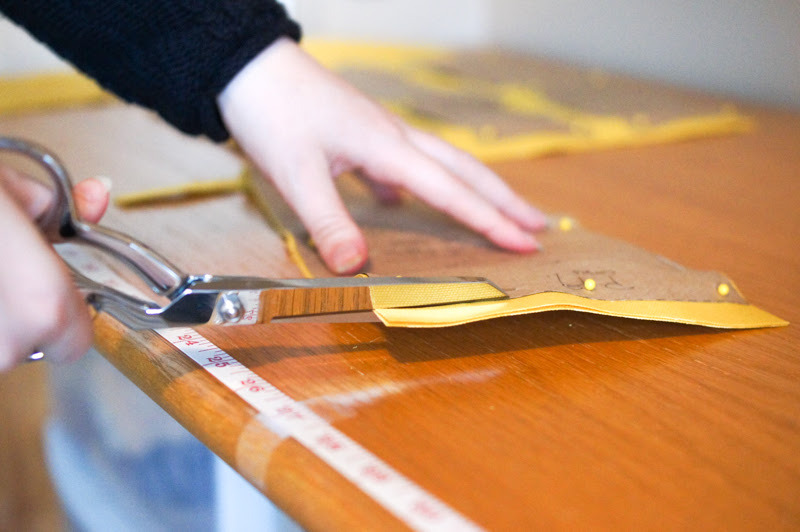 The last few months I haven't been all that active with my sewing for a variety of reasons. My summer was pretty crazy with my internship and I was doing so much sewing there that I really didn't have the time, energy, or motivation to be working on my own projects and so I stepped back for a bit. I thought once the internship was over I would get back into my own sewing, but I really needed a break, so I didn't force myself. The last two months I also spent a bit of time out of town, and I think we all know that that always takes time away from our precious hobbies. This weekend I spent a couple hours sewing for the first time in a really long time. And it felt so good to get back to it. I think with everything we do, creative or not so creative, it's good to take breaks, even if they aren't intentional. Taking a break allows it to germinate, for lack of a better term, in your mind and refresh the activity. It's all part of the process. Sometimes taking a break can be a little scary. I know for myself, I put a lot of pressure on myself to be constantly learning and improving, and not doing anything seems like the opposite of those. But you know what's worse? Burning yourself out and not having the passion anymore. After taking a break I always have more motivation and inspiration than before, because all that time I wasn't sewing I keep thinking about it. And when you don't have the pressure of needing to do something, you usually start thinking about it differently and more creatively. So take a breath, sit back, and know it's okay to take a break. You'll be inspired and back at it again in no time. It's time for another Costume Spotlight, and with The Last Jedi just around the corner I thought I would talk about Rey's newest costume. I first saw leaked photo's of this costume in the summer, and let me tell you, I was not happy. Everyone was sharing the pictures and fangirling over it, but I didn't share they're love. But before I get into my own opinions, let's get into some details. The costume, designed by Michael Kaplan, is very similar in design to her costume from The Force Awakens (2015), which he also worked on as Costume Designer. The [new] costume has long gray pants, tall boots, a tabbard wrap, tunic, and the same arm wraps from before. 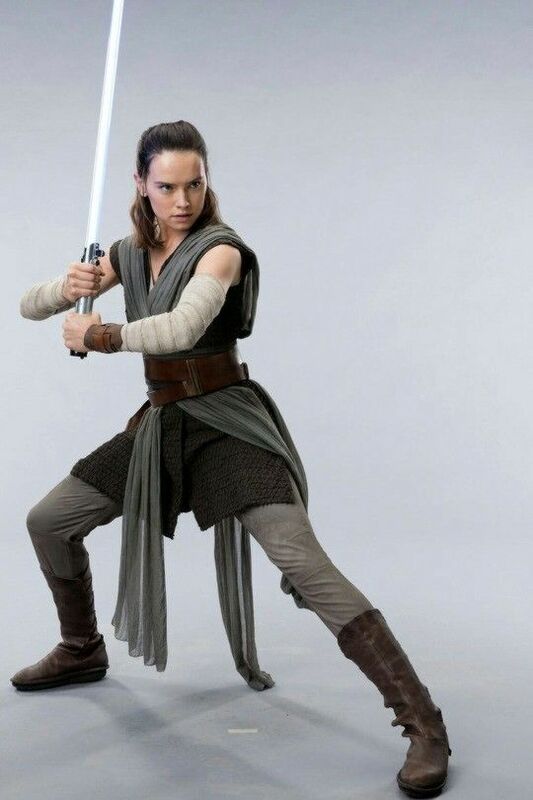 The belt is very similar to the one she wore in TFA as well, however it's a bit larger in width and, like the rest of the costume pieces, is slightly darker in color. 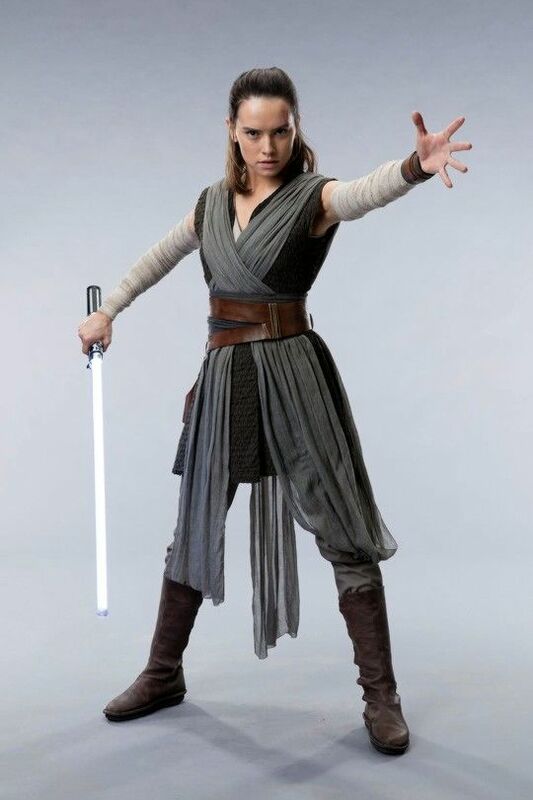 The costume combines elements from her original costume in TFA, as well as adding in some more classic Jedi elements such as the the tunic, which has a classic Japanese look to it. She also has a dark obi underneath her belt. The colors used are darker compared to her original costume, which will be interesting to see how that plays out in the film. If it's similar to The Empire Strikes Back it could be a hint at her possibly turning dark, though the colors are just much deeper and more rich that the classic evil colors usually used in past Star Wars films. I like the use of texture in this costume. Between the soft weave of the tunic, the light wrap and the smooth leather, it makes for an interesting combination and feels like it fits into the planet that we've seen her and Luke training on in the trailer. Now to what I don't like about it. It's so similar to her previous costume, which I understand from a story point of view, but she's out on a completely new planet where I'm pretty sure she didn't make her own clothing. So why would it look so similar from what she had before? It just feels lazy and like they're trying to take the "safe" route by basically using what worked before. The fit of her pants is another thing that really bothers me. It is a little difficult to see exactly what they look like, but from these photo's is looks like they don't fit her well. Though, it looks to me like they could be styled to be tighter in the calf and looser in the thigh, thought I don't think that's likely. I guess we'll have to wait until the film comes out to see more. Also, I think Rey is the first female lead in Star Wars to have short hair. It's not the worst thing, but I like the fanciful long hair we've seen before.